Duration/repetitions: 3 times. But for relief of thyroid problem, you may practice up to 11 times. Technique: Bring your mind to the throat and contract it (referring to glottal contraction). Throat contraction is just like when you close the fist by contracting your hand. Beginners should first simply practice inhaling and contracting the throat and making short sounds like "oo" "oo" several times during one inhalation. Having acquired the awareness of throat contraction and some voluntary control over throat contraction, you are ready to practice Ujjayi. Deeply inhale while contracting the throat and making a sharp shrilling sound like "OO." Stop at the half or three-fourth point of your inhalation capacity. Avoid filling air all the way into the upper chest without close supervision of a teacher. 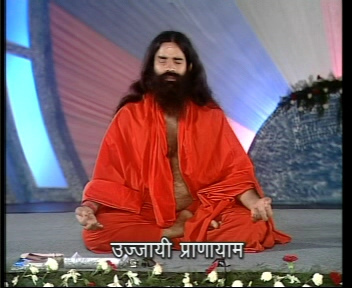 Apply chin lock (Jalandhar bandha) and hold the breath to your comfortable capacity. Close the right nostril with the right hand and exhale from the left nostril. Each time when you are ready to exhale, exhale from the left nostril. Benefits: Modifies thyroid problems, snoring and asthma. Note: Please always end the pranayama sequence with Nadi Shodhana or soft Ujjayi so the breath slows down and inhalation and exhalation is equalized. When you end your practice with soft, slow and equalized breathing, you minimize the chances of ending your practice with too much carbon dioxide (hypercapnia) or too little oxygen (hypoxia) in your system.